National Defense Minister Hulusi Akar and U.S. Defense Secretary Jim Mattis spoke over the phone late Monday, a Defense Ministry source told Anadolu Agency. 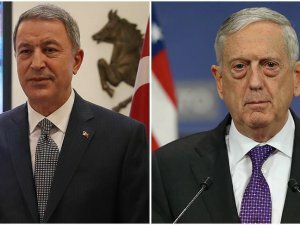 Akar and Mattis exchanged views on the Turkey-U.S. defense relations, Syria and the fight against terrorism, the source, who spoke on condition of anonymity due to restrictions on talking to the media, said. Syria has been locked in a vicious civil war since early 2011, when the Bashar al-Assad regime cracked down on pro-democracy protests - which erupted as part of the "Arab Spring" uprisings - with unexpected ferocity.